Cut flowers from the garden can be transformed into unique underwater floral arrangements by submerging the blooms in the water. Submerged flower arrangements are easy to make with a clear glass vase of nearly any size. Flowers are trimmed to fit within the vase and can be stacked in a vertical arrangement. 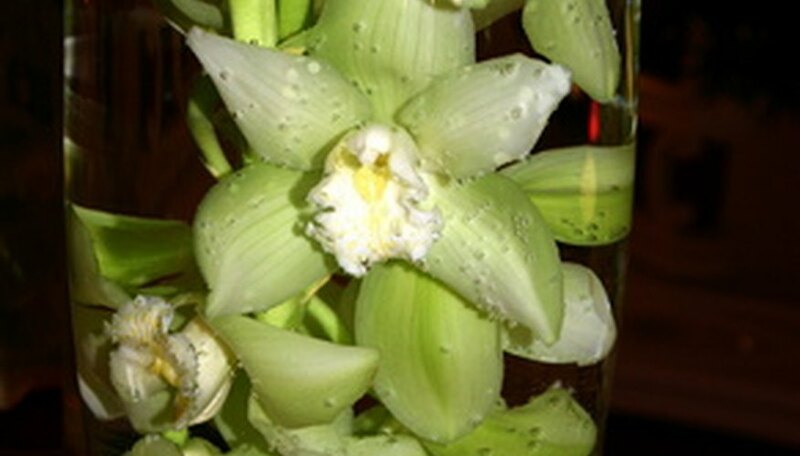 Flowers with sturdy, thick petals will hold up better in water than thin delicate flowers. Roses work well for submerged arrangements and fit in vases of nearly any size and shape. Roses can be displayed with or without the stems, and several rose heads can be stacked for a dramatic arrangement. Roses may have a tendency to float. If using the stem, roses can be secured to the bottom of the vase with a florist frog covered in marbles. Tulips are good for underwater arrangements--their thick petals will stay firmly attached while submerged. Tulips, like other flowers with hollow stems, might float too much. They can be weighed down by hiding a fishing hook in the bottom of the stem. Gerber daisies are sturdy enough for submerged arrangements. Daisy blossoms can also have their stems completely removed and floated on top of the water. Add gel to the water to keep Gerber daisies from floating up to the top of an arrangement or wedge the stems into a florist frog. Orchids work well in underwater arrangements. Their petals are stiff enough to stand up to the water and the blooms are heavy enough to stay submerged. Spring dogwood blooms are heavy enough for underwater displays when left attached to their woody stems.